Definition at line 954 of file DependenceAnalysis.h. Definition at line 957 of file DependenceAnalysis.h. 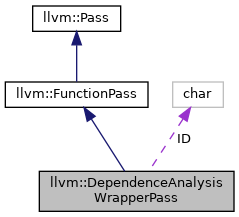 References llvm::createDependenceAnalysisWrapperPass(), F(), llvm::PassRegistry::getPassRegistry(), info, llvm::initializeDependenceAnalysisWrapperPassPass(), print(), and runOnFunction(). Definition at line 152 of file DependenceAnalysis.cpp. Definition at line 148 of file DependenceAnalysis.cpp. Definition at line 191 of file DependenceAnalysis.cpp. 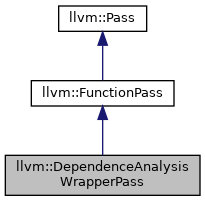 Definition at line 150 of file DependenceAnalysis.cpp. Definition at line 140 of file DependenceAnalysis.cpp. Definition at line 956 of file DependenceAnalysis.h.